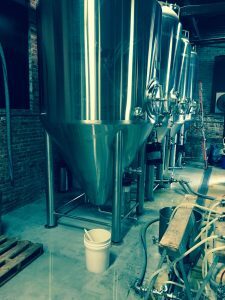 It seems to be a matter of consensus among craft beer brewers and aficionados that we are living through the greatest time in history to be a beer drinker in America, a sort of “golden age of beer.” In 35 years the number of craft breweries in America has risen from around 80 to over 5000 making a huge variety of flavorful lagers, porters and my favorite, IPA’s. While providing U.S. drinkers, be they beer snobs or guzzlers with an almost endless variety of unique tastes, the craft beer industry has become a viable part of the local economies. However, a recent opinion piece in The New York Times by Jim Koch, the founder of The Boston Beer Company, told a cautionary tale. It seems lax government antitrust laws and the business practices of a few mega global brewers like Miller Coors may be bringing about, “…the beginning of the end of the American craft beer revolution.” To get a local perspective, and to taste some great beer were ample reasons to visit Demented Brewing in Middlesex, NJ. After the field was winnowed down to the final four, Demented was named the best craft brewery in New Jersey by the judges of NJ.com. The word BREWERY marks the spot. Siri got me to 600 Lincoln Blvd in Middlesex easily enough, but the brewery was a little disconcerting. Set back from the street, partially obscured by another building, Demented looks to be a former auto repair shop. 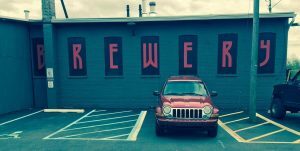 Large letters in red on black spelling, “Brewery,” fill what were once windows, and you can see people through an open garage door working amid oak kegs and stainless steel equipment reminiscent of the AMC series, Breaking Bad. The Head Brewer later confided that much like the operation producing the illicit product depicted in the popular series, the quality of the beer largely depends of the cleanliness of the equipment. A large part of a brewing run is cleaning. Where does one get a beer? On the left side the building is a nondescript, black door with a small sign cautioning you to watch your step. At the risk of barging into a private work area, I opened the door to find a small, cozy brick walled taproom where four or five people were sipping and discussing the product. 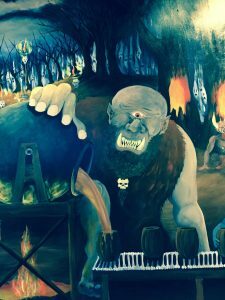 The walls were murals depicting various demonic creatures, well, brewing beer. The obligatory blackboard behind the bar above the taps listed about 15 titles with asterisks indicating which ones were available. 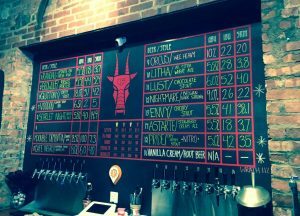 The inspiration for the brewery’s theme, The Jersey Devil, is the centerpiece of the board. Before I could sit down, the man behind the bar asked me if I’d been there before. It seemed a rhetorical question, he seems to know his clientele, but after answering no, he said, “Do me a favor and go through that door to take a tour of the brewery.” Since this appeared to be a prerequisite, I complied. A stack of one sheets illustrating the brewing process were in a compartment on another black door. I went through and found myself amid brewing equipment, oak casks and bags of malt from Germany. The workers paid me little mind on this self-guided tour, but one young man with a beard asked me why I took a picture of the malt bags. I asked if he purchased any ingredients locally, and he replied that save for the occasional local hops, New Jersey doesn’t really produce the ingredients necessary for the brewing process. He purchases far and wide. He apologized for the “mess” saying that they had just finished brewing. The brewery was considerably less messy than my own living room. As it turns out, I was speaking with Doug Phillips, the Head Brewer of Demented Brewing. He modestly downplayed the NJ.com award, and though he was familiar with the Times article, was not pessimistic in the least. “We can’t brew enough beer,” he stated simply. The brewery has over 600 clients in the State of New Jersey with hopes of expanding to Pennsylvania and New York. In order to keep the supply flowing, Demented brews at least six times a week, sometimes twice a day. 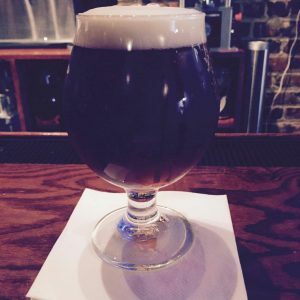 Double Dementia IPA – You be the judge. Back in the bar, I ordered the Double Dementia IPA. It’s the kind of brew that makes me take a picture with my phone to remember in case I see it on a menu again. It has the hoppiness of an IPA balanced by the malt. It is not bitter, has citrus hint with perhaps a touch of caramel. Names of craft beers are half the fun, and Demented is no exception when it comes to the inventive titles. Beowulf, Scarlet Night, Orcus, Wrath and Envy were listed. Dave Rawlins, the bar man and associate brewer assured me that all seven deadly sins are represented on a seasonal basis with one exception: Lust is available all year long. The beer can be very strong with alcohol contents up to 10%. I followed the DD with a Voodoo IPA, a relatively new offering made with fresh Lemondrop hops. I’m no expert, but I found the Voodoo to have a lighter texture with almost a hint of shandy in the taste. While I generally drink a Cote de Rhone when I am defying doctor’s orders with a rack of lamb or a porcetta, either of the IPA’s I tasted could accompany a hearty meat dish. It may become my go- to drink with meatloaf and mashed potatoes. The atmosphere in the tap room is convivial. The complexities and attributes of the beers are freely discussed. “Growlers” and “grunts” are available to go, as well as tee shirts and hats. I bought my wife a tee shirt that simply read, “Demented.” That ought to put me in Dutch. It’s an American and New Jersey success story. Doug comes from Tinton Falls by way of Vermont. He says he learned brewing in his mother’s kitchen, a parenting story that I envy. The owner of the brewery who was not there that day, is Tom Zuber, a software engineer who, according to a framed article on the wall of the bar, apparently lost his job, opening up the doorway of opportunity to begin brewing beer. He found the premises on Craig’s List, began brewing in May of 2015 and serving in the tap room in August of that year. I have to say that aside from the delicious beer, the assembled staff of Demented Brewing combined with the demonic décor and welcoming atmosphere make this local Jersey business a pleasant visit. I know they want to keep it simple, but I hope that they incorporate some kind of limited menu in the future. After just two strong IPA’s, I felt the need of a hero which I purchased down Lincoln Blvd. at L and D’s Sapore Ravioli & Cheese. That’s a whole other story. Do yourself a favor and check them out as well. Since departing New York City 37 years ago for New Jersey, I have found that you can get any food or drink available in The Big Apple somewhere in New Jersey cheaper, just as good and often better. With places like Demented Brewing, it should be easy to support your local business. 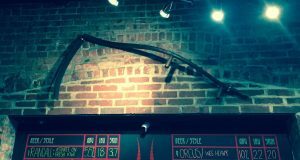 On a final note, above the bar hangs a scythe, a handheld farming tool still used to harvest crops, cutting them close to the ground. But it is also the tool carried by someone we will all eventually make the acquaintance of, the grim reaper. Life is short, so for crying out loud, do yourself a favor and stop by Demented Brewing for a couple of great glasses of beer. 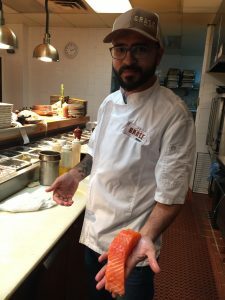 Chamon Laercio (aka Junior) worked for several years in the restaurant business before deciding he didn’t want to open his own restaurant. 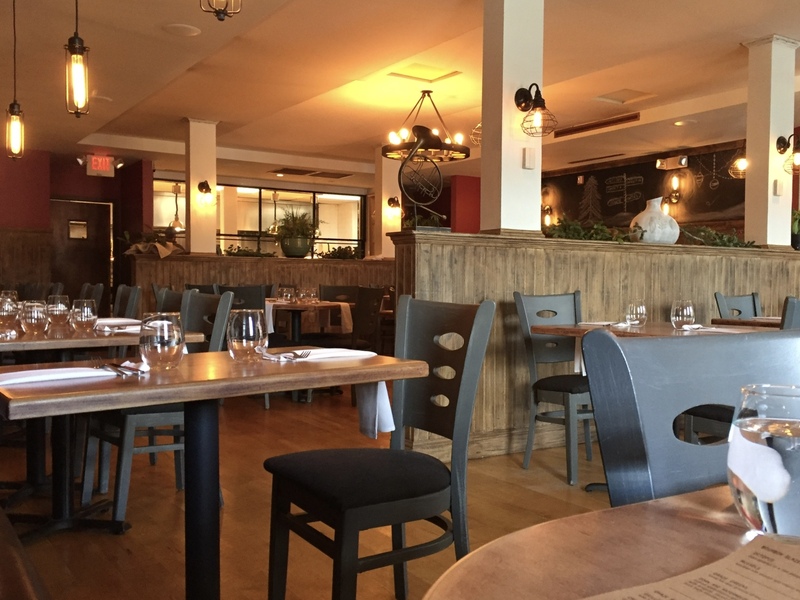 After running a successful catering company for four years, he bought Zoe’s in 2015 and gradually began changing the menu to serve more locally sourced food and less of the standard and ubiquitous “Penne Vodka” type of dish, he explains. “Most other places can’t tell you where their food came from,” says Junior, noting that New Jersey is catching up with the local food trend and after a difficult transition, he has a “clientele that understands” what he’s trying to do. 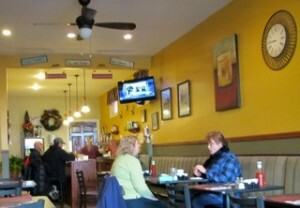 Junior’s new clientele is regional, not only local. 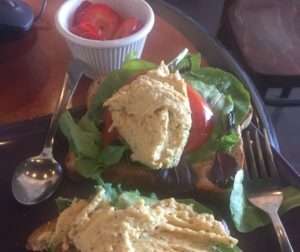 Friday jazz nights are popular, he says, and Graze just opened for lunch as well as dinner. You can typically find Junior either cooking or talking to patrons about their experience. Classically trained in French cooking but with Brazilian-born parents, Junior reflects his culinary heritage with dishes such as coxinhas: “Brazilian chicken croquettes with green tomato ketchup.” The “Bourbon Glazed Carrot Soup” garnished with micro-celery, is a staple, as are local harvest greens of the day and a four-cheese mac and cheese dish for which he makes not only the pasta, but also the cheese! 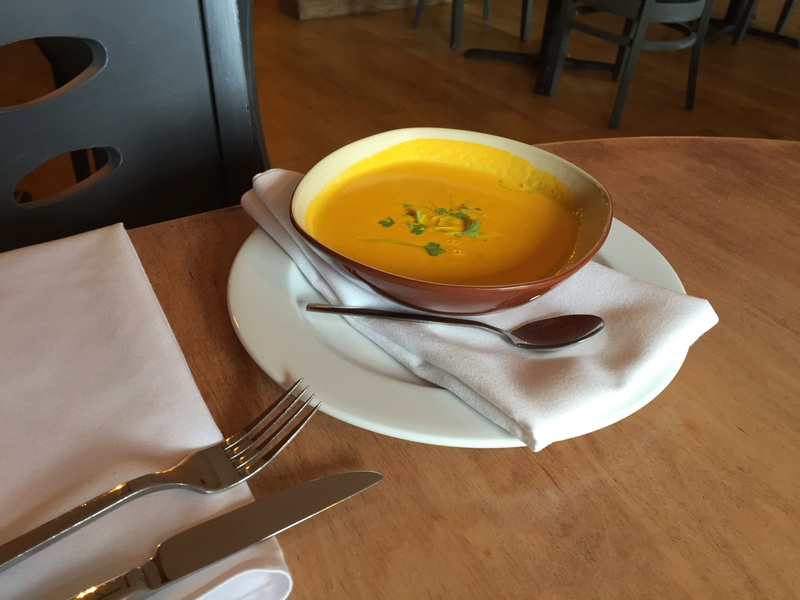 Bourbon glazed carrot soup is a delectable specialty of Graze’s kitchen. Junior also does his own butchering and tries to use every part of the animal in his cooking. He points to a pasture raised pork chop. Not 100 percent of his food comes from local sources, though. The “toughest part” is that some foods are hard to get in the Garden State year round, although greenhouses make it possible to find, for example, heirloom tomatoes in winter. He works with Harvest Drop, a local middleman, and uses about 30 different farmers in total. A born teacher, Junior says he hopes to advocate and raise awareness of the desirability of local food, both for its freshness and to support local business. “My goal [in purchasing] is to support local farmers and farmer’s markets,” he says, adding that there are more than ever before. There are a great many local farms in New Jersey that people don’t realize exist. Where did Junior get his interest in food? Both his parents have the cooking gene. His mother cooked for the Brazilian consulate at one time and his father owned a bakery in the U.S. and a dairy farm in Brazil. Tell your local friends about Local Joan by sharing this post. Lester rides into the bike store on a Saturday afternoon in May. Leaning over his handlebars, he asks employee Pete Leather how much he owes him for a recent flat tire repair. Immersed in another repair, Pete doesn’t answer immediately. With the frames and innards of bicycles surrounding him and wrench in one hand, he pauses his work. Owner Kerri Martin, a former investment banker, looks over. She knows Lester is looking for work. She tells him this one’s on the house. 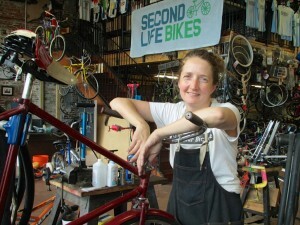 Second Life Bikes in Asbury Park is not just a business. Owner Kerri Martin has a passion for teaching kids about bikes. . . and life. It’s been featured in Family Circle, the Star-Ledger and on national TV. Kerri runs the shop as well as a nonprofit whose mission is to impart life and job skills to local youth. Kids older than age 11 can sign up to earn their own secondhand bikes by completing 15 hours of bike repair. 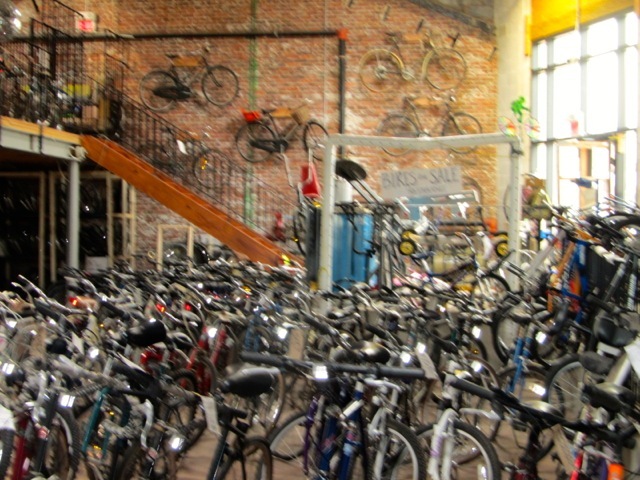 More than 1,000 bikes crowd the former warehouse where Second Life is housed, near the Asbury Park train station on 21 Main Street. 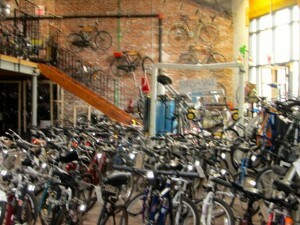 More than 1,000 bikes live at Second Life Bikes. Kerri’s goal by the end of 2014 is to be a partial owner of the 7,500-square-foot building Second Life leases. Her efforts, including crowdfunding, have raised $50,000. She’ll be buying it as part of a real estate development corporation with other investors. She points out the cruiser Bruce Springsteen bought and then donated, which hangs on the wall. 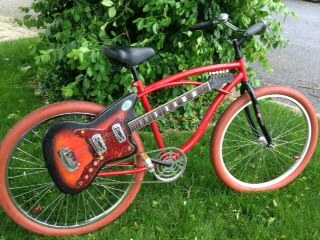 Another cruiser (pictured) is being raffled off at RiverFest in Red Bank on the last weekend in May by Musicians on a Mission (MOAM), a local group of musicians who donate their talents to raising money for local charities. Soon to go home with a lucky winner at Red Bank’s RiverFest –raffle proceeds to Second Life. Last month MOAM raised money for Second Life Bikes with a music festival in Farmingdale, known as MOAM-A-PALOOZA. The cruiser being raffled off has a partially functioning guitar, a Silvertone electric, permanently affixed to it, an idea Kerri and her small staff thought would be fun to build. 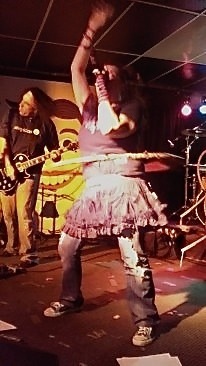 “Originally we were going to do a fake guitar, but a local musican donated this one,” Kerri says. 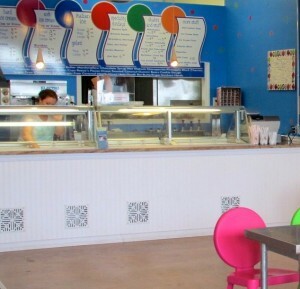 The winning ticket for the raffle will be drawn Sunday June 1 at Marine Park in Red Bank. Pete started as a volunteer but after being laid off asked Kerri if his volunteer work could be transformed into a permanent role at Second Life. Now he’s a happy corporate refugee. “It’s less stress and less bucks,” he says. 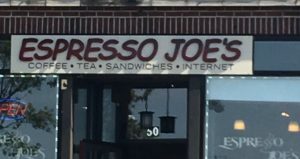 Remember how the hardworking indie bookstore owner, played by Meg Ryan, was crushed by the chain bookstore opening in her neighborhood in the 90s blockbuster “You’ve Got Mail”? 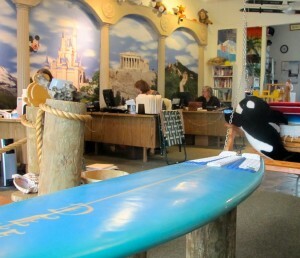 In 2007 Rita F. Maggio retired from teaching and opened BookTowne on Manasquan’s Main Street. The independent bookstore is a species so endangered that mega-author James Patterson has pledged to donate a million dollars to them. 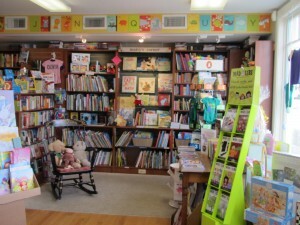 Yet BookTowne has become a destination for both national and local authors, and for book lovers, families and school communities. Mary Higgins Clark will visit May 2nd, and Jane Green (Tempting Fate) May 1st. “When someone writes a book,” she says, “They have a story to tell. It’s really important for independent bookstores to give them a venue. 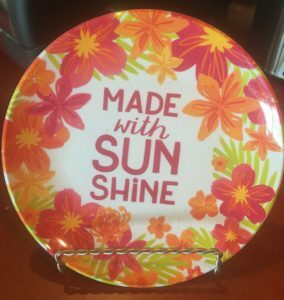 A local author may have a good quality piece and with some exposure, he or she can really take off.” She keeps local authors on her shelf for three months. 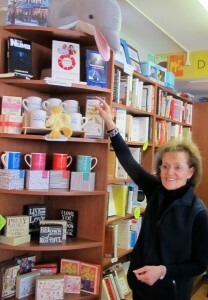 Open every day except for four major holidays, the store’s tag line is Where Good Friends Meet Good Books. Rita’s own tastes run to authors such as Anna Quindlin and Jumpira Lahira. 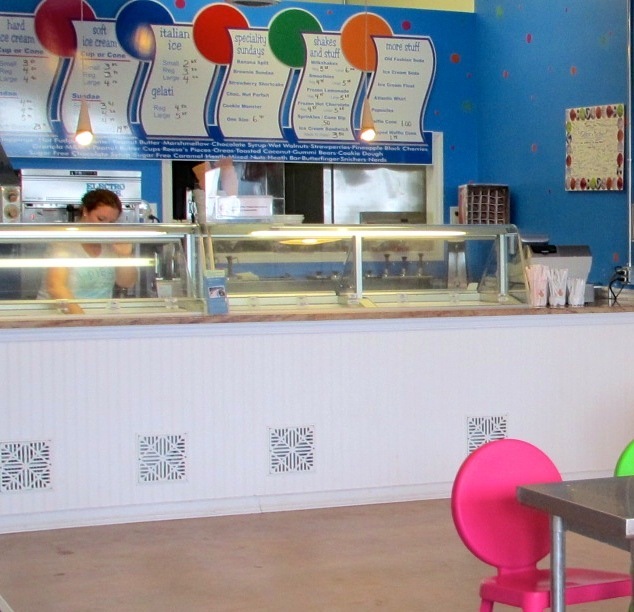 “I knew I wanted to be at the shore and I like the town of Manasquan itself,” Rita says. The Brielle library and the Algonquin Theatre lend their facilities for large book signings such as Gutman’s. 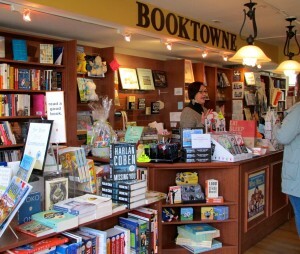 BookTowne, with three employees, generously supports local authors. But, it vets the books carefully before extending an invitation to an author. “We want to present good quality books. We don’t accept every local author. It has to be professionally done.” When she read “The Numb,” self-published by Lauren Kehoe, a 19-year-old student at Ocean County College, she was enthusiastic. It’s a dystopian novel set in a dark future in which emotions have ostensibly been eradicated. “The Numb has done well here,” says Rita, gesturing to the shelf where a copy of the book is displayed. BookTowne’s goal is to have one author reading a week. Winter’s a little harder, but with the help of an event planner and some networking, it’s attracted some best selling authors. 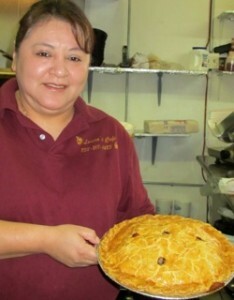 She actively supports her local business community. When big guns such as Amazon.com fought to avoid paying taxes for online sales, Rita traveled to Trenton to testify on behalf of local businesses. 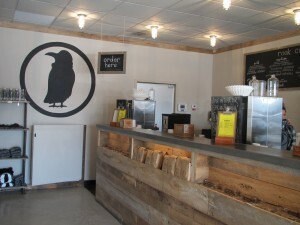 When I first ventured into a Rook Coffee Roasters, I had to change my expectations about coffee bars. There were no tables except for a counter at the window with coat hooks. No tea, no espresso drinks, no cooler with a million items to distract me, only a small baked goods selection. With a spartan interior, everything about Rook says, “We’re serious about coffee.” It’s a solo performance and the coffee’s the star. 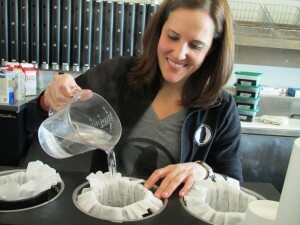 “Most Americans are used to drinking stale coffee,” explains co-owner Holly Migliaccio. Across the street from Rook’s newest location on Route 35 in Oakhurst, there’s a bustling Starbucks. Yet the line at Rook spills out the door in the mornings. Maybe these people are onto something. 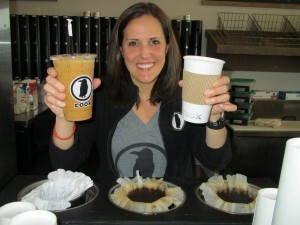 Migliaccio and her business partner, Shawn Kingsley, opened their first Rook Coffee Roasters on Monmouth Road in Oakhurst four years ago to bring some West Coast coffee appreciation to New Jersey. The entrepreneur and mother of two likes Starbucks, she says, and has nothing against tea. “We want to be different,” she says. “We are experts at what we do. It’s our business model. Every single cup is brewed to order,” and “there are no urns of old coffee sitting around.” The imported beans are roasted locally in a private “roastery,” and transported quickly to its four Monmouth County venues. In less than a minute, the process is done. The beans are measured, ground, then transferred into a filter where steaming water is poured over them, and the coffee is poured into a cup and handed to the customer. This “manual drip pour-over” method is the “most simple way to make coffee, by hand.” And, Migliaccio says, the difference in taste is unmistakeable. 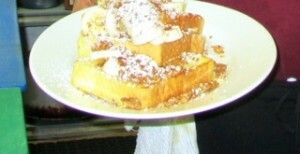 Most of its clientele are return customers and Rook servers know their regulars. The shop has cultivated a loyal following that proudly displays its logo of a black crow, or rook, defined by Merriam Webster as “a common Old World gregarious crow.” “Rook piercing,” she notes, is piercing the upper ear cartilage. The owners, both Shore Regional High School graduates, ended up in New York City after college, she in sales and marketing; he, a trader and analyst. They each tired of the city grind (sorry!) and wanted to return to the shore. She quit her job at age 30 and traveled in Asia for three months. When she returned to N.J., he suggested the idea of a specialty coffee shop and she loved it. Now they have 47 employees and a full-time corporate trainer to make sure the employees get the mechanics and the service right. “We set the bar for our customer experience extremely high,” she says. Rook does no traditional advertising, relying strictly on word of mouth and social media marketing. The owners contribute to their local community by donating to schools and gift auctions. View video how Holly and Shawn sourced their coffee from hundreds of choices in Central America and also see a clip about their business story that was part of a larger documentary, Growing up America. You can sample a handcrafted cup of coffee, organized from mild to dark, at Rook’s four locations, two in Oakhurst, and one in Long Branch and at the Little Silver train station, where baristas time their production to the train schedules. Just don’t ask for a cappuccino. Will Asbury Park’s long-awaited, oft-failed renaissance finally happen this time? 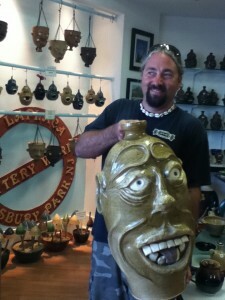 The entrepreneur, teacher and artist sold his wood-fired and pit-fired creations in Asbury Park and Point Pleasant until Superstorm Sandy rolled through in October 2012. He’d moved his Asbury store from Cookman Avenue to the boardwalk in 2007, then got clobbered by Sandy five years later. After the store flooded, he was forced to rip out the sheetrock and rebuild. Insurance covered nothing because the damage came from the ocean, excluded from his coverage, which he’s since cancelled. No power and a curfew shut down his pottery classes in Point Pleasant. He now uses his Point location as a workshop. 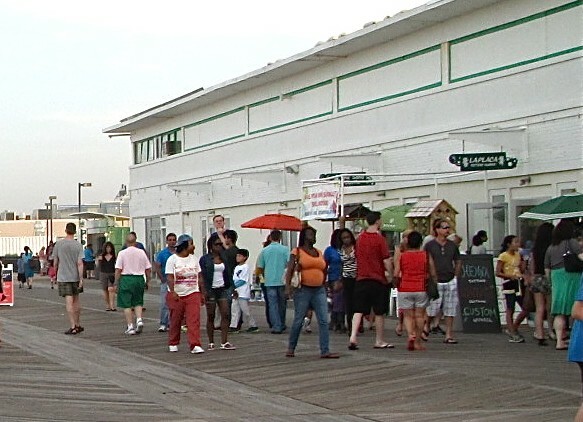 Asbury, though, is completely open, and LaPlaca is hoping for a strong summer season to make up for the many lost months of traffic while the boardwalk was closed. “The worst thing was the town put a fence up and left it, putting me out of business until April,” he said. He had some tables in convention hall, but still lost Christmas business. 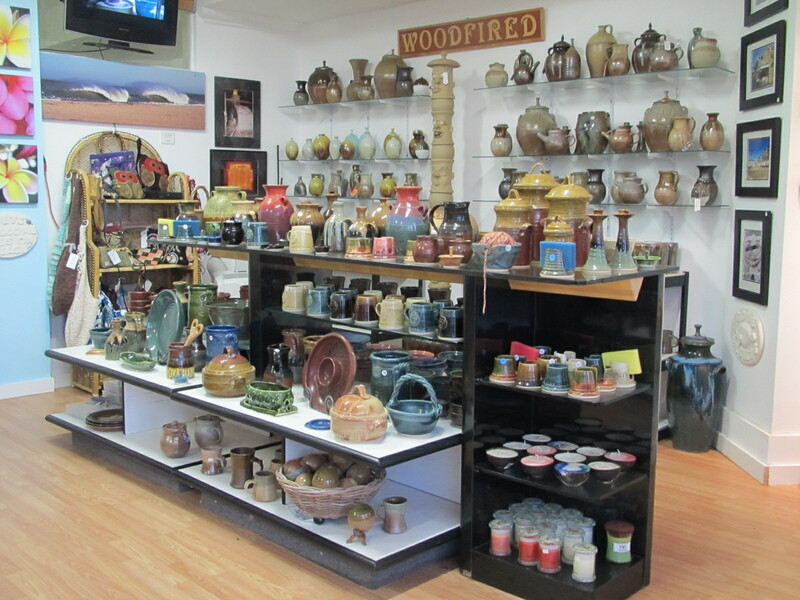 LaPlaca’s store was recognized as “best of NJ” for gift shops by New Jersey Monthly magazine in 2011 and 2012 and by the Asbury Park Press Readers’ Choice contest for favorite art gallery in 2012. Ninety percent of the store’s offerings he makes himself. His mother produces quilted and crocheted bags that LaPlaca sells along with his seaglass jewelry, (Asbury Park icon) ‘Tillie’ memorabilia and his own photography. Novelty soaps come from visits to a brother living in Hawaii. 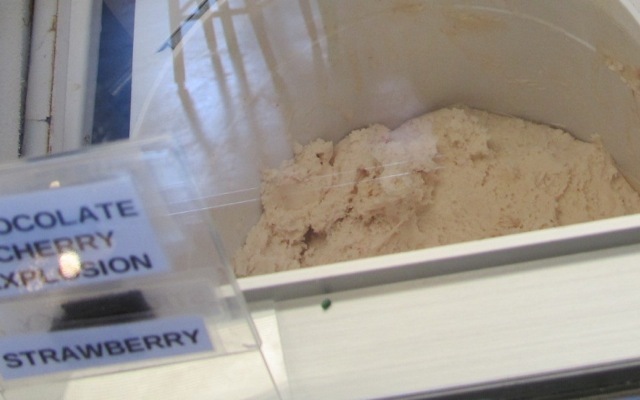 One customer favorite has a rich Southern history. “Ugly Jugs” were created in the 19th century with human-looking eyeballs and teeth to scare children away from the moonshine typically stored in them. Pottery with faces dates back to Egyptian times, LaPlaca says. “I’m a handmade in America potter. I can’t compete with imports, it cheapens everything else in the store.” He tries to keep his prices affordable. A mug is $20 and a majority of the store’s items cost less than $50, he adds, and many less than $10. 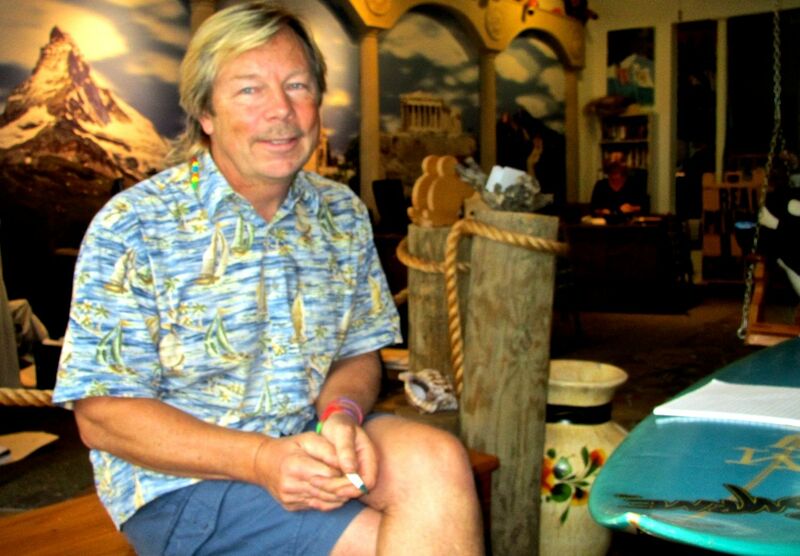 LaPlaca says he’s committed to his beach location, although others questioned his decision to locate in a tourist town even before the storm and the last two months of erratic weather have been rough on his business. He loves being there anyway.